What is Churg-Strauss syndrome (CSS)? HomesyndromesWhat is Churg-Strauss syndrome (CSS)? 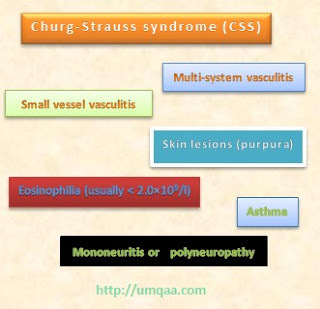 Churg-Strauss syndrome is a small vessel multi-system vasculitis characterized by cutaneous vasculitic lesions, eosinophilia (usually < 2.0×109/l), asthma (usually mild), mononeuritis or polyneuropathy and rarely glomerulonephritis (10% cases). Gastrointestinal and cardiac involvements are also recognized. Pulmonary: Pulmonary findings dominate the clinical presentation with paroxysmal asthma attacks and presence of fleeting pulmonary infiltrates. Asthma is the cardinal feature and may be present for years before overt features of multi system vasculitis become apparent. Cutaneous: Skin lesions include purpura and cutaneous and subcutaneous nodules; occur in up to 70% of patients. Cardiac: Cardiac involvement is characterized by myo-pericarditis. Biopsy and histopathology: Necrotizing granulomatous vasculitis with extravascular eosinophilic infiltration on lung, renal or sural biopsy. What are the phases of Churg-Strauss syndrome? 2. The eosinophilic phase, which can remit and recur for years. It is characterized by the onset of peripheral blood and tissue eosinophilia, resembling Loeffler’s syndrome, chronic eosinophilic pneumonia or eosinophilic gastroenteritis. 3. The vasculitic phase, which usually occurs in the third or fourth decade of life and is characterized by a life threatening systemic vasculitis of small and occasionally medium sized vessels. This phase is associated with constitutional symptoms and signs, fever and weight loss. 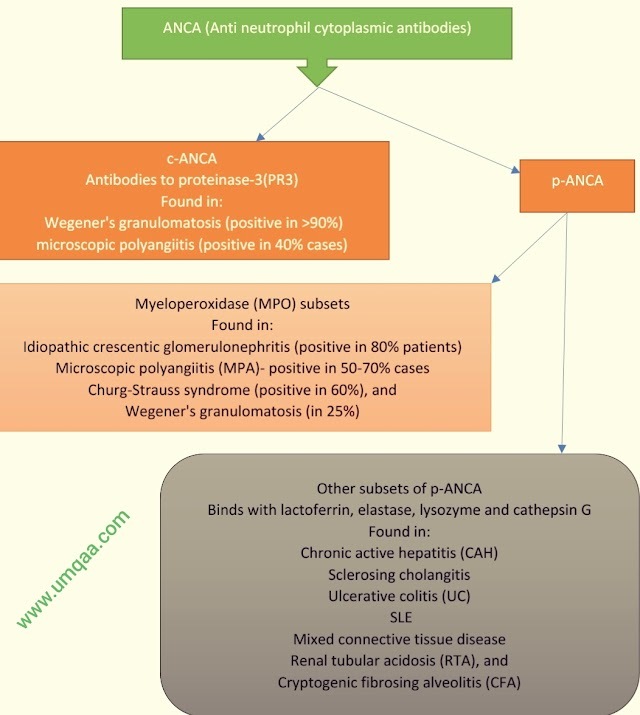 Related question: What are the diagnostic criteria of Churg-Strauss Syndrome?